Imagine having the opportunity to sit at the feet of some of the most influential worship leaders of our day drawing from their experience and insight, this DVD allows you to do just that. Watch, listen and discover how, step by step, these worship leaders address such issues as planning a worship set, selecting songs, creating flow and rehearsing with their bands. Engaging interviews offer a useful blend of practical and theoretical content that is sure to equip, encourage and motivate the growing worship leader. Features: Brian Doerksen, Brenton Brown, Kathryn Scott, Matt Redman, Andy Park, Tim Hughes and host Dan Wilt. 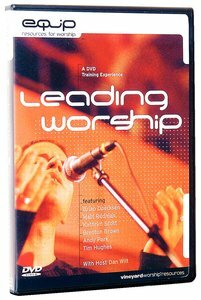 About "Leading Worship: A Training Experience"